THE Marchello Racing Team has enjoyed two successful practice days at Wakefield Park in Goulburn and is now gearing up for Friday's Shoalhaven on Show in Nowra. 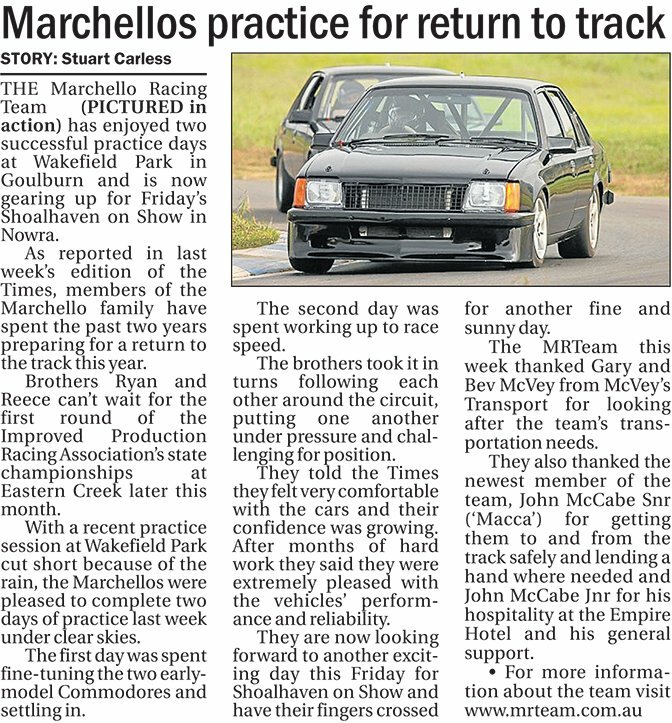 As reported in last week's edition of the Times, members of the Marchello family have spent the past two years preparing for a return to the track this year. Brothers Ryan and Reece can't wait for the first round of the Improved Production Racing Association's state championships at Eastern Creek later this month. With a recent practice session at Wakefield Park cut short because of the rain, the Marchellos were pleased to complete two days of practice last week under clear skies. The first day was spent fine-tuning the two early-model Commodores and settling in. The second day was spent working up to race speed. The brothers took it in turns following each other around the circuit, putting one another under pressure and challenging for position. They told the Times they felt very comfortable with the cars and their confidence was growing. After months of hard work they said they were extremely pleased with the vehicles' performance and reliability. They are now looking forward to another exciting day this Friday for Shoalhaven on Show and have their fingers crossed for another fine and sunny day. The MRTeam this week thanked Gary and Bev McVey from McVey's Transport for looking after the team's transportation needs. They also thanked the newest member of the team, John McCabe Snr ('Macca') for getting them to and from the track safely and lending a hand where needed and John McCabe Jnr for his hospitality at the Empire Hotel and his general support.